Bowalley Road: “Prepared To Make Any Sacrifice” – How New Zealand Went To War in 1914. “Prepared To Make Any Sacrifice” – How New Zealand Went To War in 1914. Signed, Sealed, Delivered - I'm Yours! 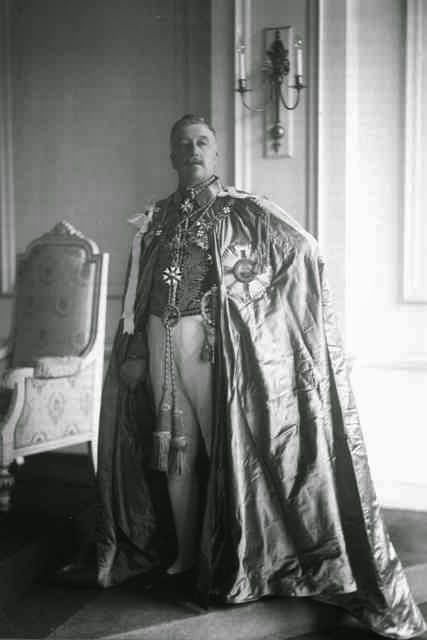 The Governor of New Zealand, the Earl of Liverpool, prepares to read the message from the King-Emperor, George V, which officially signalled this country's participation in the First World War. A conflict that would, ultimately, claim the lives of 18,000 young New Zealanders. HOW DO YOU THINK New Zealand went to war in August 1914? No, this is not an operational question about military units, points of embarkation and troop carriers. What’s being asked here is a constitutional question. Essentially, by what process were New Zealanders impelled into a state of war? Did Parliament declare war on Germany? Were the ties of empire invoked? Was the German Emperor’s dismissal of Belgium’s 1839 Treaty of Neutrality as a mere “scrap of paper” held up by the then Prime Minister, Bill Massey, as an indisputable casus belli – cause for war? Were the Members of New Zealand’s Legislative Council and House of Representatives enjoined to stand by their King-Emperor and commit the Dominion’s armed forces to helping Britannia put Germany’s upstart Kaiser back in his box? Massey’s conservative Reform Party would certainly have voted for war. But what about the Opposition? Would the Liberal Party leader, Joseph Ward, have dared oppose Britain, France and Russia’s war with Germany? Not likely. With an election looming in December, Ward would, almost certainly, have thought it better to play the “national unity” card. After all, the Liberal Party had not been defeated at the ballot-box. Bill Massey was Prime Minister only because, two years earlier, he had managed to carry a Vote of No Confidence against Ward’s predecessor. Reform was desperate for a popular mandate – especially after the divisive events of 1912-13. But the Liberals were not the only occupants of the Opposition Benches in August 1914. Alfred Hindmarsh’s United Labour Party had two votes to cast – as did the new, more left-wing, Social Democrats. What would Paddy Webb, the firebrand socialist from the West Coast seat of Grey, have to say about New Zealand joining an imperialist war? And James McCombs, the SDP Member for Lyttelton? Why would a left-wing intellectual, and the newly-elected representative of Lyttelton’s working-class, vote for a war between Kings and Kaisers? The truth is, we shall never know how the New Zealand Parliament would have voted on the question of whether to join Great Britain, the French Republic and the Russian Empire in a war against Germany and Austria-Hungary – for the very simple reason that all the key decisions that led New Zealand into the First World War were made in London – not Wellington. The Governor: Arthur William de Brito Savile Foljambe, Fifth Earl of Liverpool. 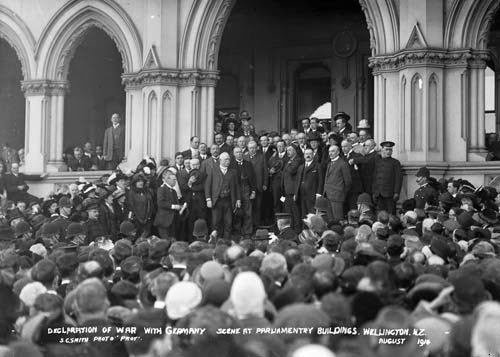 New Zealanders officially learned that they were at war Germany and Austria-Hungary only when, on 5 August 1914, the Governor of New Zealand, one Arthur William de Brito Savile Foljambe, fifth Earl of Liverpool, stood upon the steps of Parliament, in front of a crowd of 15,000 Wellingtonians, and read the following missive from the King-Emperor, George V.
And that was that. Flanked by the Speakers of the Legislative Council and the House of Representatives, and with the Judges of the Supreme Court and an assortment of MPs providing him with a fine patriotic backdrop, the Governor acknowledged the cheers of the King-Emperor’s subjects and returned to Government House. Liverpool’s words were very far from being empty. In the years ahead, and in the company of “the other dominions and dependencies of the Crown”, New Zealand would send nearly a tenth of her population – 100,000 young men – to “maintain her heritage and her birthright” as a member in good standing of the British Empire. Fully 18,000 of that terrible tithe of New Zealand’s population would lose their lives in the service of King-Emperor, and a further 41,000 would be wounded. Exactly how Liverpool, the man who in October 1913 – less than a year earlier – had authorised the deployment of military and naval personnel - "Massey's Cossacks" - to suppress what came to be known as the “Great Strike”, was in any position to know what “New Zealand” thought about sending her sons to war is difficult to discern. There had been no debate by those “New Zealand” had elected to represent her. Nor is it clear by whose leave Liverpool authorised the making of “any sacrifice” in the name of victory. Not a single vote had been taken. Amidst all the commemorations, and all the tearful invocations of the 18,000 young men who did not “grow old, as we that are left grow old”, it is as well to remember that it is not in the monarchical tradition to ask the King’s (or the Queen’s) subjects if they want to – let alone whether they should! – go to war. It remains a matter for the “Executive” alone. This is as true today, as a much smaller force of New Zealand soldiers prepares to depart for the Middle East, as it was in 1914, when thousands of volunteers embarked for their fateful rendezvous with terror, disfigurement and death on the sheer slopes of Gallipoli. A version of this essay was originally posted on The Daily Blog of Monday, 20 April 2015.